Seventy-four years ahead, to be exact. Somehow, someway—nuclear war, alien attack, no one really knew—Earth was going to be destroyed and left a lifeless cinder. It was every Intertemporal agent’s goal to find out how and to prevent disaster. But suddenly the problem had become Pierce’s special assignment. And just as suddenly, the man for all ages had been mentally blocked from knowing what was going on. What he didn’t know was that he was now programmed to kill—and was being pushed to the end of the world…. Golly, this book sure did have a lot going for it. I mean, when it comes to world-building with some great, original ideas, this book had it all. A good setup, societal after-effects, all that jazz. Over and over again. This book had so many fun ideas that it was hard to keep up with them all. Between an interesting method of time travel (that really wasn’t time travel at all, turns out), a society creeping to the edge of homo superior, and a credible threat to Earth and the ramifications thereof, this book was jam-freaking-packed with things that got my imagination imagining and my appreciation muscles appreciating. There was a lot for me to like. And yet, we have a problem. One I’m trying to figure out. One I can’t exactly explain, although I think I’ve discussed it before. All the livelong day until I finished the book and went to bed. Sometimes it’s like a book has a mental shield over it that keeps me from concentrating on the pages. I manage a few paragraphs and then my brain starts to drift. Maybe the cat needs petting. I guess I could make a sandwich. I wonder how many palindromes I can think of in five—no, better make it six—minutes. Usually this kind of thing happens when I’m reading a book that hasn’t got much going for it. The Day of the Klesh stands out for having so much detail and so little else, while Doomsday Wing was probably the first really boring book that felt like it didn’t want to be read. The difference here is that The Empire of Time had so many neat things going on that it feels like a shame that I couldn’t concentrate on it. If I’m going to put anything down to this book and not some kind of undiagnosed Attention Deficit Disorder, I’d say that its issues lie partially in the fact that in terms of backstory there was a lot going on, and even though it was all clever and smart like I said there was just so much of it that it’s hard to keep straight. Jerry Pierce is the aforementioned guy. He starts off as pretty unlikable, but eventually we learn why. There is a lot of “eventually we learn why” in this book. Jerry is a time-traveler. Sort of. See, the time-travel in this book is pretty different from most forms. People don’t hop around across the timestream, they hop across universes. At one point in the fairly recent past, it was discovered that there are various “chronoplanes,” or timelines that travel at different rates. A scientist named Ishizawa discovered them and how to travel back and forth between them via portals called I-screens. Twelve of the chronoplanes, including the home one, are perfectly habitable. They are, after all, just Earth in the past. The home one is set in, as of the time of writing the book, in the future year of 2015. Of all the books of science fiction I’ve read, I don’t think I’ve ever stumbled upon one where the book takes place in the year I’m reading it. That’s a new one on me. Other chronoplanes are set in such years as 1804, 1180, 107, and so forth, all the way back to 70787 BC. There are two chronoplanes that represent the future, 2239 and 3571, respectively. The Earth in these two timelines is wrecked. The oceans are evaporated, the atmosphere is nonexistent, and the world is extinct. A large part of Pierce’s job, and that of the International Federation he represents, is finding out what happened—or will happen—to make these worlds the ruins that they are. There are a few clues. It seems that in both of these timelines some kind of giant beam hit from space, but no one knows what caused it. The leading opinion is that it was not a natural disaster, but rather some kind of extraterrestrial alien thing. So, utilizing the combined resources of the other eleven chronoplanes, mankind has united and set out to prevent this thing from happening. The problem is that they’re using all sorts of uncool methods to do so. Some of those things involve direct intervention with the other chronoplanes, displacing people up- or downtime to where they’re needed, sending entire populations from 2015 back in time to make room for others that might be able to avert the crisis, and tampering with the development of history. Pierce himself claims to have wiped out entire native populations and personally killed Genghis Khan before he could be an issue. An upshot of all this is that, unlike most time-travel narratives, the timecops in this book are not here to prevent history from being altered, but to interact with it and utilize it in the struggle against Doomsday. The different chronoplanes are not kept in the dark about this situation, but are told all about it and must be dealt with. For example, one of the running elements is the ongoing negotiations with Thomas Jefferson in 1804. All of this is so great. I’m loving it. One of the resources that the IF looks for in the past are people called “Trainables.” Pierce is one of those, although he’s from the present. Trainables are people with the ability to absorb large amounts of information very quickly. This makes them useful as scientists, researchers, administrators, and temporal agents. Trainables do not comprise the majority of humanity, but there are enough of them throughout history that it’s worth trying to find as many as possible. As a result of this new class of super-humanity, they’ve become the premiere citizens, while all the other people are basically human cattle. The two groups do not get along. The public resents the Trainables, their powers, and their privileges, while the Trainables hold everybody else in contempt. So that’s the two big “what ifs” that make up the background to this story. Pierce’s mission in this book is to travel to the chronoplane of Orc (12165 BC) and figure out what, exactly, is going on there. It seems to be some kind of bid for independence on the part of the colonial government. This will not stand. Notable is that Pierce doesn’t have much of an idea what he’s supposed to do, either. He’s been “Blocked,” nominally so that he can’t spill any of the details of his mission because he doesn’t know what they are until certain triggers have been met. Orc is being used by the International Federation as a science station and armory. It’s the forefront of research when it comes to preventing Doomsday. It has recently discovered a means of projecting an electromagnetic lens into space for use in astronomy. Essentially, it bends light in such a way that you end up with a telescope lens miles across. Pretty useful, although the project is going more slowly than anticipated. It’s hard to keep the thing stable. So Pierce runs around, getting into danger and action sequences, avoiding being murdered, and so forth. Honestly, most of what happened to the main character was the boring part of this book. In a narrative where the point of the thing seemed to hinge on these huge concepts, dealing with just one little guy was not especially exciting. He doesn’t seem to be all that exciting to write, either. Instead of piecing together the mystery from clues over the course of the book, Pierce gets everything info-dumped on him about three quarters of the way through the book, after which he goes rogue. This info-dump comes in the form of Anita !Kosi. She’s a member of an African ethnic group called the !Kosi, found in a chronoplane called Luvah (22233 BC). The !Kosi are notable because every single one of them turned out to be Trainable and, unbeknownst to everyone until the events of this book, psychic. Anita is able to un-Block Pierce, spooling out his memories for him. He remembers some of the terrible things he’s done on behalf of the IF, as well as the details of this particular mission. It all has to do with the electromagnetic lens the folks on Orc have discovered. It can be turned into a terrifying weapon, essentially a big magnifying glass that you can put between the Earth and the Sun, focused, and turned into a giant beam. The folks on Orc want to use it to declare their independence. The folks in the IF want to destroy it for two reasons. Obviously, they don’t want the folks on Orc to be independent and/or use it against anybody else. But the other reason is that it’s clear that this is the device that the folks downtime used to destroy themselves. This is the reason for Doomsday. Since it’s a man-made structure and the solution to preventing Doomsday is just “don’t use it,” it doesn’t give them a leg to stand on anymore. See, Doomsday was the complete justification for both the IF’s existence and their abhorrent policies. Preventing people from knowing about it means that they get to keep existing and doing the things they do. You can draw lots of parallels to actual events in history that have allowed governments to do some pretty gross things, from Cold War interventionism in Southeast Asia to our very own Patriot Act. Basically, the IF is a government acting like a government does when its only goal is to keep perpetuating itself. Knowing this now, Pierce sends out a message to all the chronoplanes detailing the plot and saves the day. We jump a few years into the future where Pierce is now a college professor. The IF has begun to collapse, bringing with it all the problems of Balkanization but also an end to some awful practices. Four new chronoplanes have been discovered in the Permian and there’s a lot to learn. Pierce has a nice talk with William Blake. We learn a neat fact (a lot of the good parts of this book are basically neat details) that William Wordsworth has recently spearheaded a legal campaign for writers and artists uptime to get royalties from their works downtime. We also learn that Pierce has decided to retire to one of the Permian chronoplanes and live out the rest of his life in peace. And that’s the end of the book. The more I think about this book, the more I like it. It really did have some great stuff going on. I just can’t explain why I found it so hard to concentrate on it. I guess the major issue is while details-wise it was excellent, story-wise it wasn’t much. And there was a lot to hold together, with a lot of it only vaguely connected. The ideas in this book spanned from the whole Trainables thing to chronoplanes to exctinct psychic African ethnic groups to corrupt governments to a future Doomsday and a lot of things in-between. That’s a lot to cram into a 180-page paperback. Maybe if the book had been longer it wouldn’t have felt so intimidating. This was Crawford Kilian’s first novel and was certainly a promising start. There are two more books in this series that, I think, are both prequels detailing Pierce’s adventures in the various chronoplanes. They are probably worth checking out. I feel like the series could only have gotten better as Kilian developed as an author. I’ll be on the lookout for them. 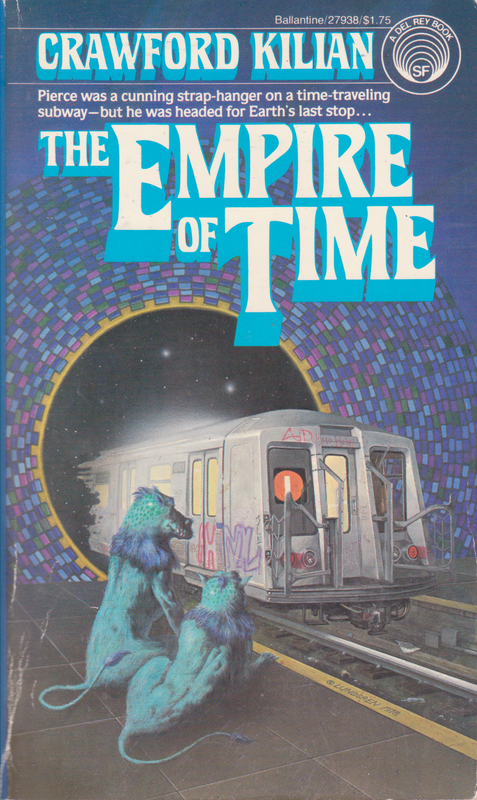 Give The Empire of Time a read and see if you had any of the same problems with it that I did. I’m still thinking that a lot of it was on my side, but I also think that the book might have benefited from being written in a less-traditional style. I think about a book like The End of Man? or something of Olaf Stapledon’s, where the book is more a history lesson and less a narrative, a book of connected ideas and thoughts without a protagonist and his issues getting in the way. I think The Empire of Time would have fit well into that kind of a scheme and perhaps would have had a bit more space to breathe and develop those neat ideas without having to worry about Jerry Pierce and his personal issues. A lot of the best parts of this book didn’t even have anything to do with Jerry and were thrown out there at us as pure expositionary chapters anyway. Maybe the whole book would have fit better into that paradigm. In the meantime, it seems that Kilian is still writing, and he has a blog that’s worth checking out if you get a chance. I’ve enjoyed the posts I’ve skimmed since finding it.